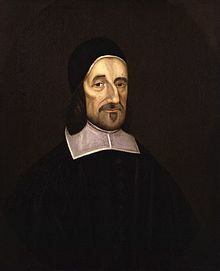 Richard Baxter (November 12, 1615 – December 8, 1691) was an English Puritan church leader, divine scholar and controversialist, called by Dean Stanley "the chief of English Protestant Schoolmen". When the Son of God comes to rescue us and bring us back to God, He does not find in us the ability to believe. The Saints' Everlasting Rest (1650), "The Nature of the Saints' Rest"
All are making haste towards hell, until by conviction, Christ brings them to a halt, and then, by conversion, turns their hearts and lives sincerely to himself. Special mercy arouses more gratitude than universal mercy. The Saints' Everlasting Rest (1650), "The Splendor of the Saints' Rest"
In hell, sinners shall forever lay all the blame on their own wills. Hell is a rational torment by conscience. The Saints' Everlasting Rest (1650), "The People Who Receive the Saints' Rest"
Reported in Josiah Hotchkiss Gilbert, Dictionary of Burning Words of Brilliant Writers (1895), p. 11. Do not mathematics and all sciences seem full of contradictions and impossibilities to the ignorant, which are all resolved and cleared to those that understand them? Reported in Josiah Hotchkiss Gilbert, Dictionary of Burning Words of Brilliant Writers (1895), p. 36. If I were but sure that I should live to see the coming of the Lord, it would be the joyfulest tidings in the world. O that I might see His kingdom come! It is the characteristic of His saints to love His appearing, and to look for that blessed hope. "The Spirit and the bride say, Come." "Even so, come, Lord Jesus." Reported in Josiah Hotchkiss Gilbert, Dictionary of Burning Words of Brilliant Writers (1895), p. 102. And therefore you must know that you can forfeit the grace and help of God by your willful sinning or negligence, though you cannot, without grace, turn to God. If you will not do what you can, it is just with God to deny you that grace by which you might do more. A Call to the Unconverted to Turn and Live, Preface. It pleased the great Creator of the world to make three sorts of living creatures. Angels he made pure spirits, without flesh, and therefore he made them only for heaven and not to dwell on earth. Beasts were made flesh, without immortal souls, and therefore they were made only for the earth and not for heaven: Man is of a middle nature between both, as partaking of both flesh and spirit, so is he made for earth, but as his passage or way to heaven, and not that this should be his home or happiness. The blessed state that man was made for was to behold the glorious majesty of the Lord and to praise him among his holy angels; and to love him, and to be filled with his love forever. As the fire doth mount upwards, and the needle that is touched with the loadstone still turneth to the north, so the converted soul is inclined to God. Nothing else can satisfy him, nor can he find any content and rest but in his love. In a word, all that are converted do esteem and love God better than all the world; and the heavenly felicity is dearer to them than their fleshly prosperity. This page was last edited on 19 December 2018, at 22:13.